COUNTBLANK Function in Excel returns the number of blank cells. In other words, COUNTBLANK Function count the cells only if the cell have no values in it. Argument range is the range of cells for which you have to count the blank cells. 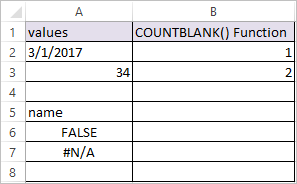 Only empty cells are counted by the COUNTBLANK function.